Ståle Kleiberg is an award-winning Norwegian composer with a very productive career in numerous music genres. Mezzotints is a collection of works written for solo and chamber ensembles over the past decade and a half. As the program listed below readily demonstrates, Kleiberg exploits a number of musical styles. The composer also pays homage to some of his musical forbears such as Bela Bartok and possibly Claude Debussy. The players on this program are Marianne Thorsen (violin), Bard Monsen (second violin in the String Quartet), Ole Wuttudal (viola), Oyvind Gimse (cello), and Jorgen Larsen (piano) and they surely give this often-challenging music its due. String Quartet No. 2 is a probing piece with its three movements having an Adagio-Allegro-Adagio, rubato form like Bartok’s second string quartet. Its third movement quotes from the finale of the Berg Violin Concerto. Ruf und Nachklang explores the sonorities of the piano, particularly its unique resonances, and while it occasionally sounds as improvised as a jazz solo, it is as deliberately structured as is a Debussy prelude. Ashes, inspired by the Edvard Munch painting of the same title, depicts two characters, one introverted resignation and the other, extroverted despair. There is a meditative nature to this piece and it certainly turns more inward than outward. The single-movement Piano Trio No.2 seems to be Debussy-inspired with its impressionistic piano melodies supported by sympathetic strings. There are not many works for a violin and cello duo and this three-movement Sonata begins with a dissonant conversation between the two stringed instruments and concludes with a rapid-fire tarantella with many shades of Bartok. The last work on this program, Sonanza e cadenza, is for violin and piano and is also the earliest. As this is not a sonata, the two instruments do play separately and not in unison and ends with a bravura violin solo that seems unfinished. This Pure Audio Blu-ray was mastered in DXD audio (352.8kHz/24-bit), and mixed down to a 5.1 DTS-HD Master Audio or 2-channel LPCM (both at 192kHz/24-bit resolution). There is also a 9.1 Auro-3D (96kHz/24-bit) (my system downconverts it to DTS-HD MA 5.1). The performances were recorded at the Sofienberg Church in Oslo, Norway that seems to be a nearly ideal venue for chamber recordings. I liked all the audio options but preferred the naturalness of the native 5.1 (192kHz/24-bit) (the Auro-3D seemed more distant). We get a high-resolution hybrid multi-channel SACD and mShuttle downloads in MP3 and FLAC formats. The program booklet has informative essays on the pieces, program tracks, performing and production credits, along with recording session photos. By definition, a mezzotint is an ancient method of making prints that is noteworthy for its ability to make images of graduated shades out of black and white. In the case of Mezzotints, we get music for chamber ensemble and soloists that will continually pique your interest. Each work presents an amalgam of interesting concepts that is well executed by these fine players. This is a disc quite worthy of your attention and one that will make you anxious to hear more of Kleiberg’s compositions. 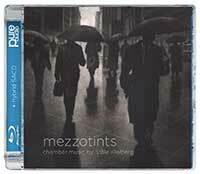 Mezzotints is a collection of modern works for soloists and small ensembles that is superbly played and recorded.